MSNBC host Rachel Maddow incorrectly stated that no protest permits were requested for President Obama’s second inauguration. During MSNBC’s day-long marathon coverage of President Obama’s second inauguration, in which exciting details such as the first lady’s bangs and outfits were discussed, host Rachel Maddow at one point remarked that no protest permits had been requested. The statement was significant for a couple reasons. One, it created the impression that President Obama was re-elected with unified glee. Why, no one even bothered to request a permit to protest! Because Obama is perfect! No one could even think of a reason to raise any grievances! Three of the five protest groups gathered along Pennsylvania Avenue. Protesters included members from the spectacularly insane group The Westboro Baptist Church, but also the ANSWER coalition, which speaks out for the unemployed and demands jobs and justice. “The least among us, as Dr. King would say, to agitate, educate and mobilize from the bottom, to have those voices for those who are still struggling, those who Dr. King would be standing for,” said Eugene Puryear, of ANSWER. The ANSWER coalition will gather at 14th Street and Pennsylvania Avenue, just blocks from the White House, but the protest is bigger than Obama, ANSWER said. “It’s to send a message to all politicians, not just the president but the senators, the congressmen, all the big business people that these are the problems, the problems of ordinary working people, that we need to be tackling,” Puryear said. Reform America Created Equal also applied for a permit to hold an anti-choice demonstration at the US Naval Memorial, while about 100 people from the Elaine Wooten Organization demonstrated about environmental issues and complexities of Native American treaty obligations. Another 100 or so protesters from the Arc of Justice Coalition rallied with speeches and music for the First Amendment at Meridian Hill. Another protest—perhaps one of the other “smaller” protests that was issued a permit, as The Washington Times had it—took place outside an exit gate from the inauguration day festivities. 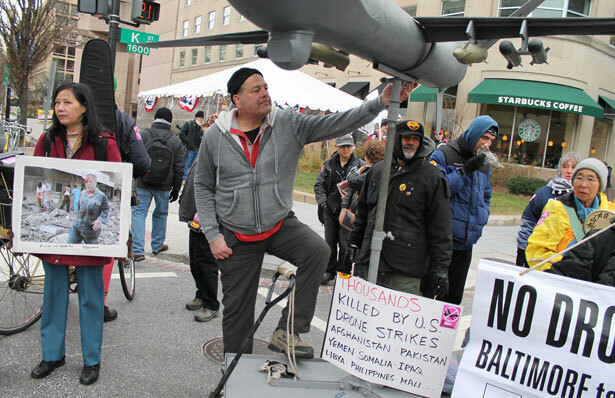 A group of protesters lay across a street on Capitol Hill to protest Obama’s controversial use of drone strikes abroad. The process of obtaining a permit is filled with obstacles for protest groups, and even when secured, activists are oftentimes quarantined far away from the subject of the protest so as to be rendered almost entirely ineffective. It makes sense Maddow would repeat the “no one requested a permit to protest” line given that no protesters were visible in the crowds lining the streets as the president’s motorcade crept along the parade route. Mostly, that’s because certain spaces along the parade route are exclusively reserved for the Presidential Inaugural Committee, a reality challenged by ANSWER in federal court. A week before the inauguration, a federal judge handed a win to activists challenging those regulations, although US District Senior Judge Paul Friedman did not address the underlying allegations that the regulations represented a violation of the right to assemble under the First and Fourteenth Amendments. And while the ruling favored ANSWER, it did not come in time to affect inauguration activities on January 21. A lead attorney for ANSWER, Mara Verheyden-Hilliard of the Partnership for Civil Justice Fund, said the activists would continue with the planned demonstration…to the extend that they’d be able. The federal government defendants “created a situation where they’re allowing a private political party to determine who may be speaking and who may be visible and whose voices may be heard along Pennsylvania Avenue,” Verheyden-Hilliard said, referring to the parade route. Certainly, to a degree, limiting the areas where activists can protest is a matter of security, but protest regulations also create the illusion of unified consent. The image of thrilled Obama supporters lining the streets, united as they cheer their president into a second term, is an extremely helpful PR tool for the administration, and the mainstream news outlets dutifully aimed their cameras at that display—and no where else—for the entirety of the inauguration. The presence of hundreds of dissenting voices nearby never even made it onto their radars. Update: To illustrate my point about how difficult it is for protest groups to sometimes receive permits, Zeke Johnson, a director at Amnesty International USA, contacted me to report that Amnesty was denied a permit for a January 11 protest at the Capitol and White House against Guantanamo because of the inauguration. For talk of social justice inside the inaugural gates, read John Nichols's analysis of President Obama's speech.